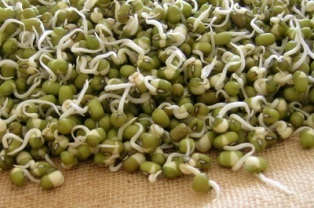 Mrs. Ketheesh Balachandran wrote, “Kurma, I have heard that mung bean sprouts are very nutritious. Can you send me a recipe that includes sprouted mung? My reply: Hello! Yes, sprouted mung are indeed very healthy! I love to make my own. You won’t get them as long as the ones you buy at Asian markets, but short-tailed homemade sprouts like the ones pictured above are bursting with juicy succulence and crisp nutrition. How’s that for a mouthful! Known as moong ki chat, this very popular salad is eaten as a road-side snack in India, especially in Delhi. The chili, lemon, and tongue-tingling spice combination chat masala give it a pleasant bite. Home sprouted mung beans taste best. Serves six. Boil the potato until tender, peel and dice it.